Skeptic climate scientists and organizations associating with them point straight to highly detailed science-based assessments when they criticize the idea of man-caused global warming, an action that saints and axe murderers can do. ‘Skeptic-trashing environmental sociologists’ devoid of any climate science expertise want you to accept the idea of man-caused global warming without question, and they dismiss skeptics out-of-hand by saying such skeptics are documented to be corrupted by illicit money. These are the only two bullets they have ever had in their arsenal – settled consensus-based science and corrupt skeptics – neither of which they have any hope of proving. Is it possible for such sociologists to have a more anti-science, anti-intellectual position than that? 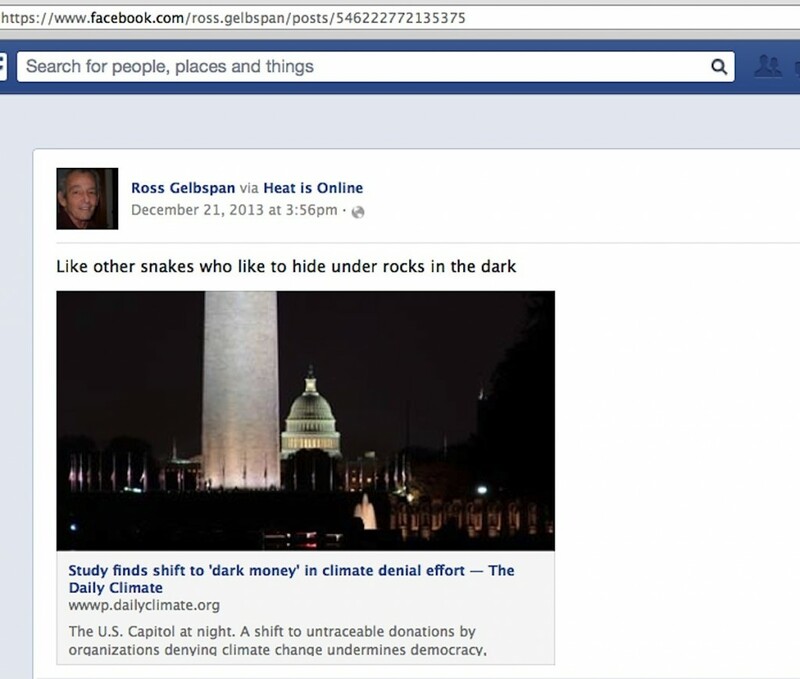 Before Christmas, I spotted Ross Gelbspan’s Facebook page mention of a DailyClimate story on ‘dark money’ corrupting organizations skeptical of man-caused global warming. A quick glance at the story revealed an unfamiliar name to me – Robert Brulle – but the rest of it appeared to be little more than the latest effort to create an ‘illicit funding enemy du jour’ for the Al Gore crowd to regurgitate. These ‘enemies’ – from latest to earliest – are Donor’s Trust, the Koch Industries / Koch brothers, Exxon, the Global Climate Coalition and the Western Fuels Association. Same old accusation every time about paying skeptic scientists to lie about global warming, different fill-in-the-blank enemy who happens to be trendy at the moment. Since Al Gore’s followers will probably never get a good handle on who Donors Trust is, it’s predictable that an easier to understand ‘dark money’ tag is now being pushed. Due to the holiday bustle and a medical problem within my family, I didn’t have a chance to look into Robert Brulle or his paper until this week, but my educated guess was that he was separated from Gelbspan by probably no more that three degrees. Surprise, surprise, it is less than that. 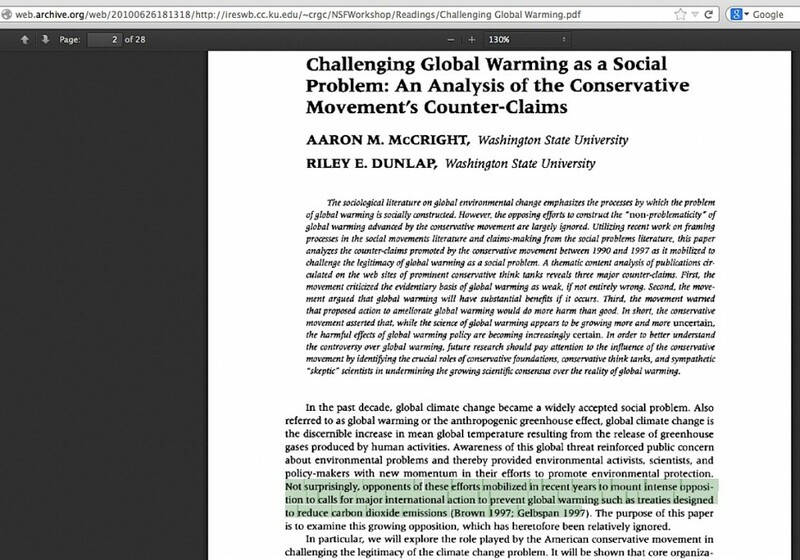 Right off the bat, Brulle’s paper gets no further than the 2nd paragraph after his introduction on the third page before resorting to a citation of a 2003 paper by professors David Levy and Daniel Egan,* [*3/10/17 Author’s edit: that link doesn’t work now, but the paper is preserved at this archive link] who themselves can get no further than halfway through their own paper before resorting to direct citations of Ozone Action and Ross Gelbspan regarding the industry corruption of skeptic climate scientists and repeating the same ‘leaked coal association memo phrase’ that is the core of the accusation against skeptic climate scientists. Levy and Egan are not sociologists, I use the term rather loosely in this blog. Just one paragraph later, Brulle, who is a sociologist, cites fellow sociologists Aaron McCright and Riley Dunlap and their 2001 paper. How predictable, McCright & Dunlap go no further than the 2nd paragraph of their introduction before citing Gelbspan. It gets worse for Brulle. 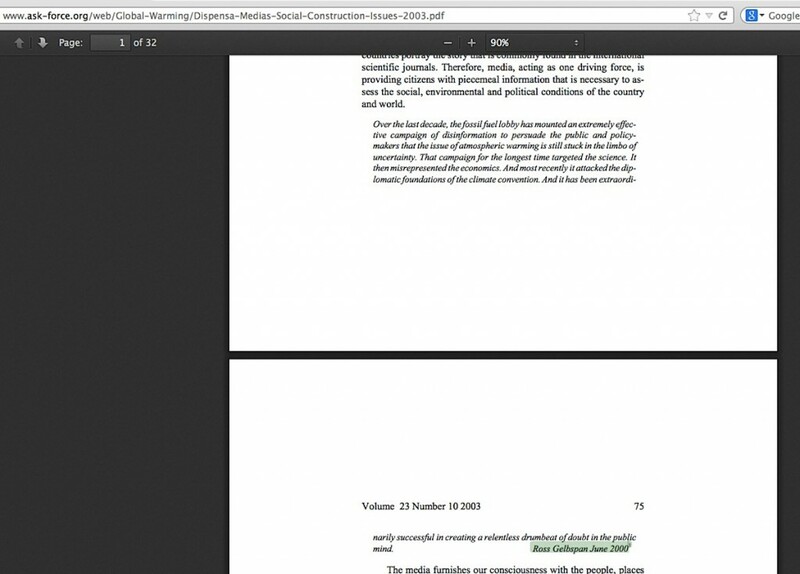 In his 2003 paper co-authored with Jaclyn Dispensa, the italicized print you see at the bottom of his abstract page and at the top of page two is a direct quote from a 2001 presentation by ……. Ross Gelbspan. That quote is designated by endnote #1, the only endnote Brulle & Dispensa felt they needed for their entire 32 page paper. 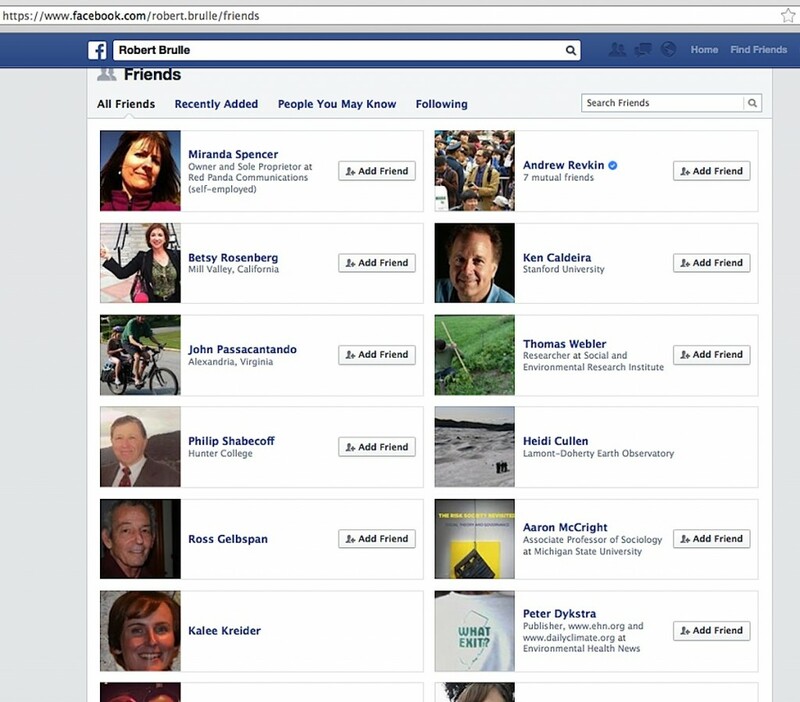 On top of that, how entertaining is it that among Brulle’s Facebook Friends we find Gelbspan, Ozone Action’s John Passacantando & Kalee Kreider, Aaron McCright, Peter Dykstra (who I covered here), and, well, several others I’ll cover at this blog later. 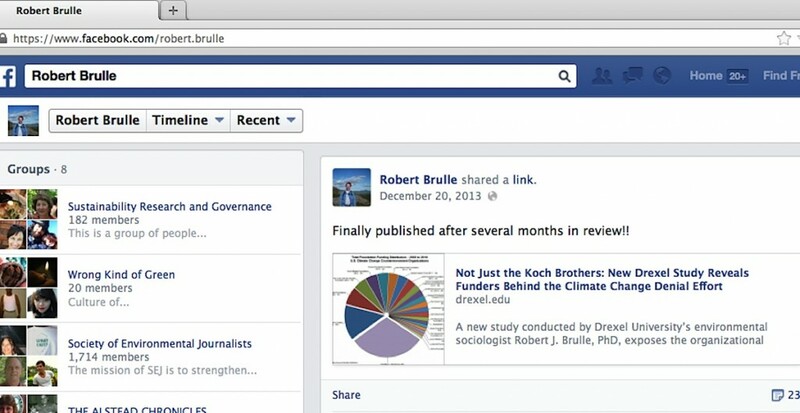 Certainly Facebook must be good for networking – Brulle announced the news of his ‘dark money’ paper being published on Dec. 20th, and Gelbspan mentioned the article covering it just a day later. So, I add Brulle to my loosely labeled pile of ‘skeptic-trashing environmental sociologists’ names: the late Bill Freudenburg, Naomi Oreskes, Chris Mooney, Jules Boykoff and Max Boykoff, Myanna Lahsen, and ‘loosest label’ of all, the late Stephen Schneider. All are enslaved to Gelbspan’s accusation against skeptic scientists, as I detailed in a 2012 WUWT guest post. 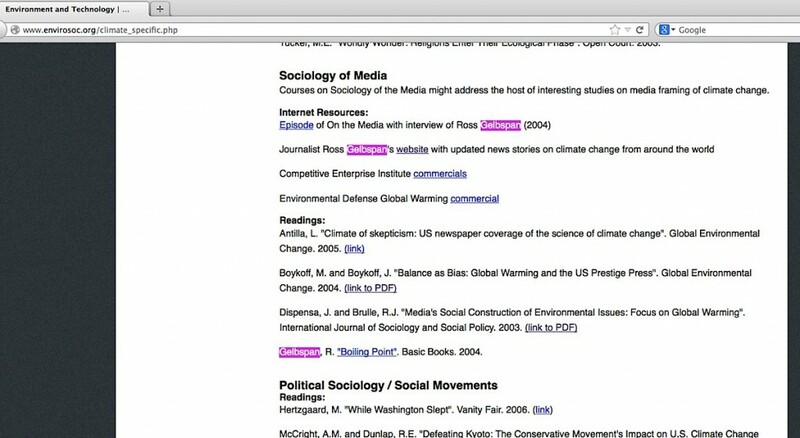 No joke, the American Sociological Association has a particular website “section” on Environment and Technology, itself with a Climate Change Teach-In page were readers who click on its “Course-Specific Resources” link will find a handy “Sociology of Media” subsection recommending the work of Brulle & Dispensa, the Boykoffs… and three separate references to Ross Gelbspan. Basic point being, these are people collectively operate in the realm of ‘climate change sociology’ under the unsupportable premise that man-caused global warming is settled science, thus it is up to them to explain to the rest of us what’s wrong with the mindset of skeptic climate scientists…. while all ultimately citing a single source for the proof that those skeptics are industry shills, the same source who never won a Pulitzer and who never offered a shred of evidence to prove those skeptics are paid industry money, ‘dark money’, or any kind of other ill-gotten money, to lie about the issue. Repeating the same question I had at the top, is it possible for such alleged PhD-level experts in human interaction to have a more anti-science, anti-intellectual position than that? 3 Degrees of Separation, Pt 1, Pt 2, Pt 3. This entry was posted in Citation Cascade, Psychological / sociological analysis, Skeptic-Trashing Environmental Sociologists, Three degrees of Separation or Less and tagged Brulle, Dispensa, Dunlap, Egan, Levy, McCright by Russell Cook. Bookmark the permalink.